When you hear the term ‘science fiction’, what do you think about? Is it Golden Age stuff from the 50s set in a shiny spaceport somewhere in an imaginary solar system? Do you see the shadow of huge, city-sized spacecraft crossing the sky? Or maybe your mind turns to television classics from the 60s such as Star Trek, Doctor Who, The Twilight Zone or even the children’s puppet extravaganza Thunderbirds? Perhaps your definition takes in those credited with creating the genre, such as HG Wells or Jules Verne. Or you might fast-forward straight to the 70s and 80s and the ironic ‘post-sci fi’ of a Douglas Adams or a Robert Rankin. In fact, a major point of Out of This World, the British Library’s recent exhibition on the subject seems to be to persuade the viewer to radically broaden their horizons and realise that, as long as humanity has been putting pen to paper and writing stories, we have been imagining our way to other worlds. The scope was truly immense, taking in everything from Thomas More’s satire Utopia, published in 1516, to contemporary graphic novels on which the ink was barely dry. The exhibition itself was divided into six themes, encompassing past visions of future worlds (both positive and negative); our attempts to envisage visitors from alien worlds and how our interactions with them might proceed; parallel worlds, where history had run along a different course to the one we learned from textbooks; virtual worlds including cyberspace, dreams and visions; the end of the world, covering every disaster scenario that our fertile human imagination has been able to come up with; and finally our utopian imaginings in perfect worlds. 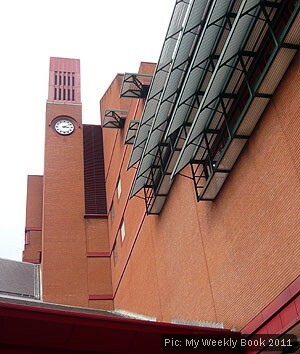 The British Library managed to turn one of the biggest possible pitfalls of this exhibition into an asset – the fact that, however you look at it, the main body of its display material is printed books, and some of them pretty small at that, as well as having the built-in problem of only allowing the display of one page at a time. It got round the relative uniformity of the exhibits by incorporating manuscripts, pictures, electronic displays and posters as well as making the display cases part of the exhibition with a fine theatrical flourish. 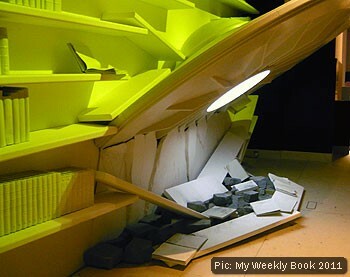 Thus the visitor met long runs of crazy shelving, a crashed UFO, one of Wells’ Martian Tripods and an apparently reactive robot all featuring prominently in the exhibition space. The exhibition itself was well spaced in order to allow visitors to linger over volumes that interested them without causing excessive inconvenience to others. And good use of display boards helped to give context, provide a visual contrast and impart a sense of spatial geography to the exhibition’s stated themes. Its crowning feature was probably the sheer variety of texts on offer and the willingness to interpret the terms ‘science fiction’ and ‘speculative fiction’ in the broadest possible ways. This allowed an investigation into how themes such as meeting ‘the other’ and exploring functional and dysfunctional societies have permeated literature in English without getting sidetracked into pointless debates about genre and authorial intention. I was pleased to see steampunk and cyberpunk both featuring, with a decent amount about William Gibson and a nice pair of brass goggles to round things off. But, the point is, no matter what your particular interests or choices of reading material, there was likely to be something here of interest to you – even if you wouldn’t normally class yourself as being particularly involved with the genre. And this, for me, was its great strength – to show the history, range and importance of speculative fiction and how much that urge to speculate about other times, other places and other realities underpins all literature and imaginative enterprise. Thanks for visiting. If you want to keep up with the latest reviews, you can subscribe to the RSS feed. This entry was posted on Sunday, September 25th, 2011 at 2:55 PM	and is filed under 2011, Events and exhibitions. You can follow any responses to this entry through the RSS 2.0 feed. You can skip to the end and leave a response. Pinging is currently not allowed.